Not all the people of the Northern hemisphere like the winter. When temperature starts to decrease and days get cloudy and dim, you might also find that it affects to your feelings. The darkness and coldness can be very distressing. 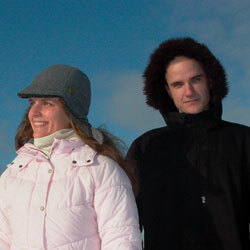 Live audiovisual performance Talvi is for discovering beautiful and joyful things in winter. Rather than hibernate and fall into gloominess people might find ways to enjoy this cold time of the year. The serene and gentle sounds DJ Orkidea and visuals of VJ *jen unfolds valuable things in Finnish winter.